The night is full of beasts — beasts that walk as men and women, that prey on those who stray from the herd, that hunger for blood and flesh when the moon rises. We will not be the sheep to these wolves. We will hunt the wolves ourselves. • A Hunter’s look at shapeshifters: those who form lunatic tribes, those who steal their power from the Devil or from animal skins, those who become infected or cursed. 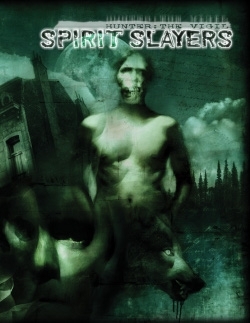 This book also looks at spirits from a hunter’s perspective. • Three new compacts and one new conspiracy: the confederation of spirit cults known as Les Mystéres. • New tools in the hunter’s arsenal for hunting shapeshifters and spirits, and rules provided to create both powerful hunter protagonists and frightening werewolf antagonists. • Hunting Ground: Philadelphia takes a look at the hunter-werewolf struggle that has been going on in the City of Brotherly Love since the Revolutionary War and before.